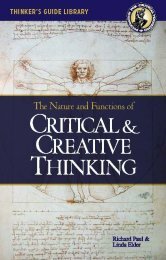 Focuses on the interrelationships between critical and creative thinking through the essential role of both in learning. The relationship between criticality and creativity is commonly misunderstood. Critical and creative thought are both achievements of thought. Creativity masters a process of making or producing, criticality a process of assessing or judging. The very definition of the word “creative” implies a critical component (e.g., “having or showing imagination and artistic or intellectual inventiveness”). When engaged in high-quality thought, the mind must simultaneously produce and assess, both generate and judge the products it fabricates. In short, sound thinking requires both imagination and intellectual standards. Throughout this guide, we elaborate on the essential idea that intellectual discipline and rigor are at home with originality and productivity, and also that these supposed poles of thinking (critical and creative thought) are inseparable aspects of excellence of thought. Whether we are dealing with the most mundane intellectual acts of the mind or those of the most imaginative artist or thinker, the creative and the critical are interwoven. It is the nature of the mind to create thoughts, though the quality of that creation varies enormously from person to person, as well as from thought to thought. Achieving quality requires standards of quality — and hence, criticality. We believe that creative thinking, especially, must be demystified and brought down to earth. For this reason, we deal with it in this guide not only in terms of its highest manifestation (in the work of geniuses) but also in its most humble manifestations (in everyday perception and thought). There are ways to teach simultaneously for both creative and critical thinking. To do so requires that we focus on these terms in practical, everyday contexts, that we keep their central meanings in mind, that we seek insight into how they overlap and interact with one another. When we understand critical and creative thought truly and deeply, we recognize them as inseparable, integrated, and unitary. To live productively, we need to internalize and use intellectual standards to assess our thinking (criticality). We also need to generate — through creative acts of the mind — the products to be assessed. That minds create meanings is not in doubt; whether they create meanings that are useful, insightful, or profound is. Imagination and reason are an inseparable team. They function best in tandem, like the right and left legs in walking or running. Studying either one separately only ensures that both remain mysterious and puzzling, or, just as unfortunate, are reduced to stereotype and caricature. Critical and Creative Thought Are Inseparable. Is Creative Genius an Exception? The Questioning Mind in Newton, Darwin, and Einstein.